Pink Lemonade: August 3rd is Watermelon Day-How are you going to celebrate??? 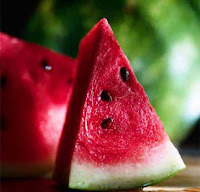 August 3rd is Watermelon Day-How are you going to celebrate??? Mark it down in your calendar-August 3rd is National Watermelon Day!!! Have a slice or two or better yet, enjoy a refreshing watermelon flavored beverage from HINT water. Watermelon is the most luscious flavor from HINT water, which has no added sugar or preservatives, perfect for those hot summer days. I missed watermelon day. I didn't know you had other blogs until I found your name above me on SITS. I only new about the Looneyverse! I will have to check out your others. Hope you have a great week.